bl.uk > Online Gallery Home	> Online exhibitions	> Asia, Pacific and Africa Collections	> Almora Bazaar. 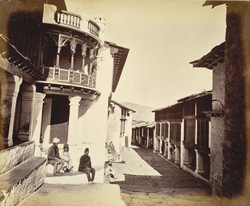 Photograph of the Almora Bazaar, from the ‘Album of Indian Views’, taken by John Edward Saché during the 1860s. Almora, situated on a horseshoe shaped hill, was the capital of the independent Hindu Kingdom of Kumaon until it was attacked and incorporated into the Gurkha Empire in 1790. After the Anglo-Nepal war (1814-16) it became a part of British India and developed as a prosperous hill station. Almora is considered to be one of the most beautiful places in the Kumaon area and is famous for the local crafts of copperware and woollens. This view looks at a cobbled street of the bazaar, with figures seated in the foreground on the steps of a building with an elaborate carved wood balcony decorated with antlers.